On the corner of Broome and Hudson in New York City, less than 36 hours before the first official practice session of the 2011 IZOD IndyCar Series season, is not exactly the place race fans would expect to find a gathering of Indianapolis 500 race winners, rookies of the year, vintage race cars, the IndyCar Experience two-seaters and executives from the Indianapolis Motor Speedway, the IZOD IndyCar Series and PVH (IZOD’s parent company). 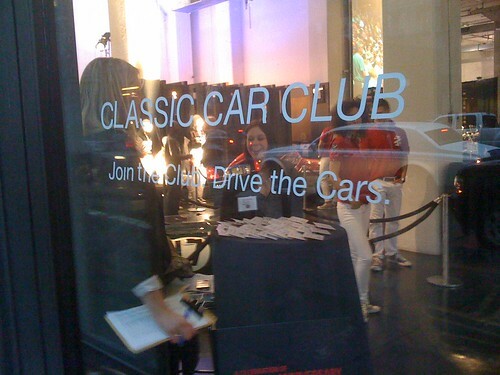 But on the evening of March 23, The Classic Car Club in lower Manhattan was a gathering spot for a national media kick-off celebration the 100th anniversary of the Indianapolis 500. The event included some of the top producers, assignment editors and reporters in the country (in addition to a few representatives of global media outlets) representing non-endemic (meaning, not sports, racing or automotive) media. 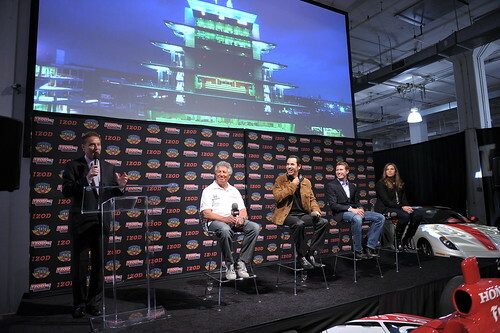 The purpose of the event was to introduce the Indianapolis 500, its drivers, its storylines and its pageantry (especially around the historically significant 100th anniversary) to media that would extend the reach of our brands (Indianapolis 500, Indianapolis Motor Speedway and the IZOD IndyCar Series). From an Indianapolis 500 fan’s point of view, the evening featured plenty of content to satisfy. Drivers (Mario Andretti, Helio Castroneves, Ryan Briscoe and Simona De Silvestro) mingled with media and posed for pictures with those in attendance. Four race cars from the 50s and 60s, as well as today’s Dallara and two IndyCar two-seaters, were on display. There were dozens of images of the stars and significant moments of the past century at the Indianapolis 500 and videos playing on various walls and screens throughout the warehouse-like facility. It was the perfect after-work gathering for Indianapolis 500 fans. But this unique blend of history and hip, stars and stories, art and action, was designed to pique the interest of the media in attendance and establish that the Indianapolis 500 is not just another race or, for that matter, another sports story. The Indianapolis 500 is an iconic lifestyle event that possesses an infinite number of stories, most of which are stories of human interest, not just a story to be told on the world’s sports pages. ABC IZOD IndyCar Series announcer Vince Welch kicked the program off for the evening and introduced Indianapolis Motor Speedway Corporation president & CEO Jeff Belskus, who hammered home the significance of the Indianapolis 500 and its position as the global steward and leadership responsibility in racing, the automotive world and the entertainment community over the last 100 years. Belskus transition to INDYCAR CEO Randy Bernard by saying the Indianapolis 500 would place significant emphasis on new transportation technology as it entered the next century and noted that the 2011 Emerging Tech Day on Saturday, May 7 at Indianapolis was the beginning to ensure that the Indianapolis Motor Speedway remains a true automotive proving ground. 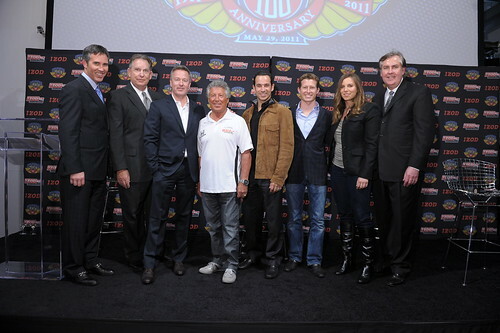 ABC IZOD IndyCar Series announcer Vince Welch, with, from left, Indianapolis 500 veterans Mario Andretti, Helio Castroneves, Ryan Briscoe and Simona de Silvestro. Bernard talked about the core goals of the IZOD IndyCar series and its focus on fans and value, while noting that the new 2012 car continued to take strides forward and would soon off the drawing board and on display for fans, teams and drivers to get an up-close view of the future of the IZOD IndyCar Series. He also expressed excitement around the start of the 2011 season and the many new story lines that would develop. Mike Kelly, PVH executive vice president for marketing, focused his messaging directly at the many lifestyle and business media that were in attendance. Kelly minced no words when he said there was no sports property that generated as much value and access for a brand as the IZOD IndyCar Series, while expressing the many boardroom reasons to participate in the sport. Kelly also talked of his first visit to Indianapolis and how he was instantly hooked because of the robust opportunities the sport presents to reach customers, build brand awareness and increase sales, all supported by the compelling storyline of INDYCAR and the “500.” Kelly also previewed some of the new INDYCAR-themed IZOD and Honda television advertisements. Each driver then talked about what Indianapolis meant to them and provided a perspective of why it was so special. Each driver admitted, without reservation, that they would trade any championship for an opportunity to drink milk in victory lane at Indianapolis. Briscoe focused on what it meant to lead the Indianapolis 500 and how he couldn’t imagine what it might be like to pull into victory lane at Indy. De Silvestro talked about her first experience at Indy in 2010 and how the sport was unique in allowing men and women to compete at the same level, with the same rules. Of the 732 starters in the history of the Indianapolis 500, 725 have been men. De Silvestro appreciates what it means to be one of just seven women to compete, but she said boldly that she wants to be the first female winner. The evening closed with Belskus offering a toast to the many men and women who have come before to build the foundation for the Indianapolis 500, to the next 100 years of triumph, passion and memories at Indianapolis, but most importantly to an exciting, safe and fast 2011 Indianapolis 500. For two hours, the media, many of whom might not otherwise have been exposed to the history and future of this great event, were immersed in the Indianapolis 500. By the time the evening ended, most were beyond talking about what they heard and experienced and had moved on to wanting to experience it for themselves, first-hand. It’s now their turn to tell the story of the 100th Indianapolis 500 in their way, through their eyes, from their experiences, to their readers, viewers and listeners. I’m a lifelong Indianapolis Motor Speedway fan and have attended or participated at some level in 34 Indianapolis 500 races. I get it honestly, as my dad was the USAC yearbook editor about the time the roadster was winning its last few races at Indy, so the Indy 500 history and tradition runs deep in my family. Currently I serve as the President of the Indianapolis Motor Speedway. My hero growing up was A.J. Foyt. When I blog, I hope to convey some of memories of IMS overlaid with my daily experiences here as I would want to see it from a true fans point of view. This media kick-off is one of the smartest, most focused ideas I have ever seen in racing. It is just what Indycar needs right now, to expand and solidify its image with those outside the sport. Bravo. Jeff Belskus, this is Mr. Tony Geinzer, and I was wondering if the Speedway would love to have costumed mascots (IE Koala or Panda) or have the 20th Anniversary of NASCAR at Indy Logo design?